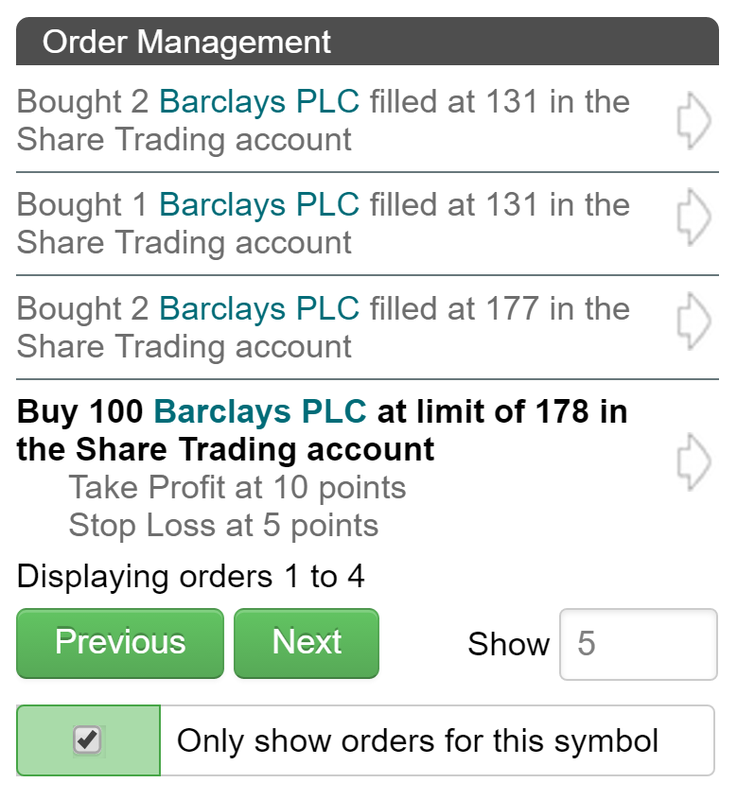 You can use TimeToTrade to trade Shares or Spread Bet. To apply for a trading account click here. 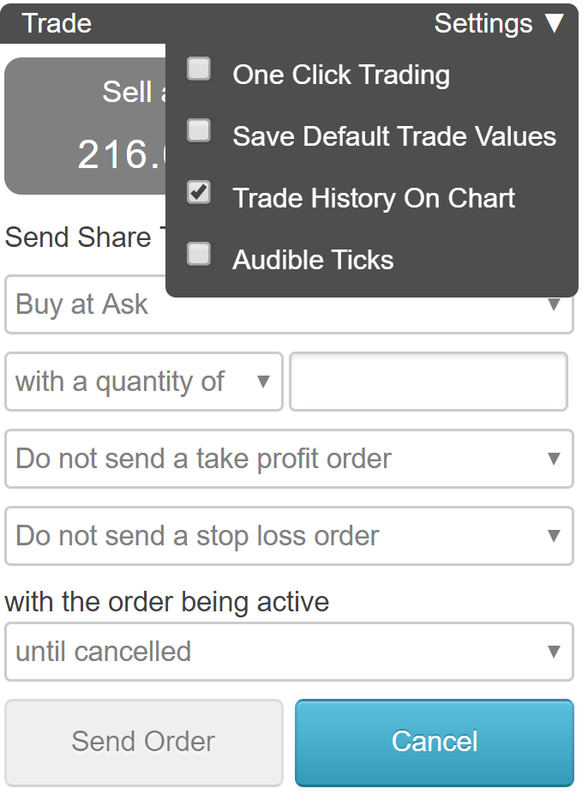 The following is a user guide on how to create share trading orders on TimeToTrade, manage open orders and view related open position information. Please go to the Trigger Trading Technology ® page for help on how to create alerts and execute trades when chart conditions are met. If there is a symbol postfix e.g. GB:IGAS.D, the "D" indicates that the market data is delayed. To see a full list of countries that are available, visit the Market Data page and for more help on how to search for markets, go to the Market Data Look Up page. 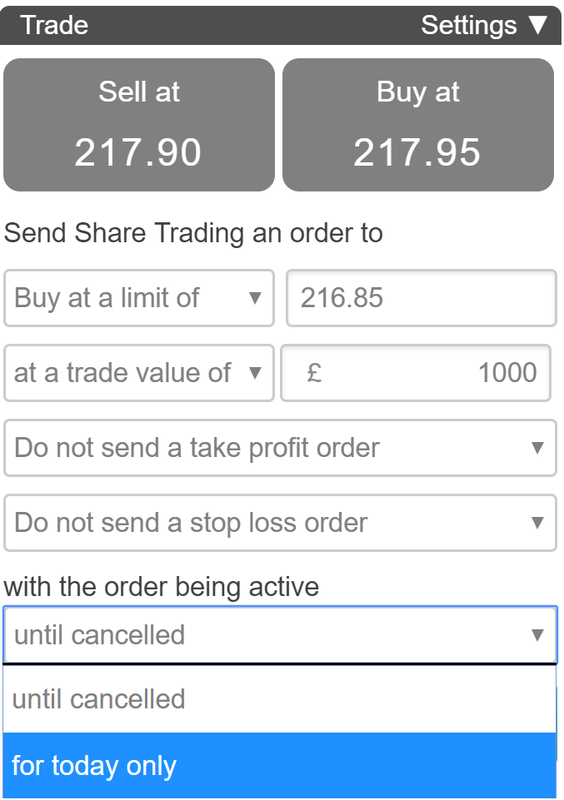 Once Click Trading - If checked you will not be prompted to confirm your order after clicking on the 'Send Order' button. Save Default Trade Values - If checked the deal ticket values that you enter for the selected market will be saved after the trade is executed. This can be useful when actively buy and selling using the same take profit and stop loss values for a selected market. The default values are saved against the selected market and are not common to all markets. Trade History On Chart - If checked the historical trades will be displayed on the chart with arrows representing the price and time the trade was executed at. Audible Ticks - If checked an audible sound will be played when the market ticks. The following sections describe the deal ticket choices available. Please note that the deal ticket choices vary depending on the underlying exchange or liquidity provider. 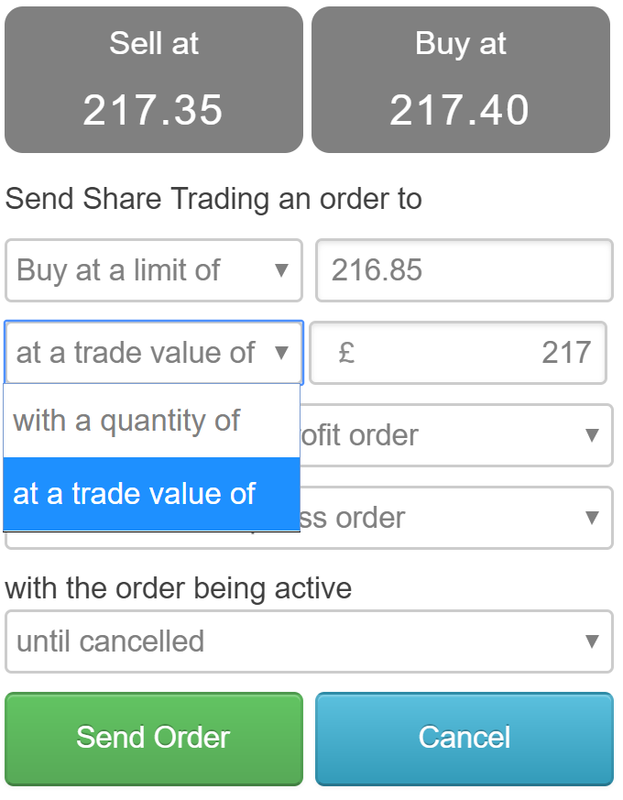 To create an order, enter the trade details in the deal ticket on the Trade tab. 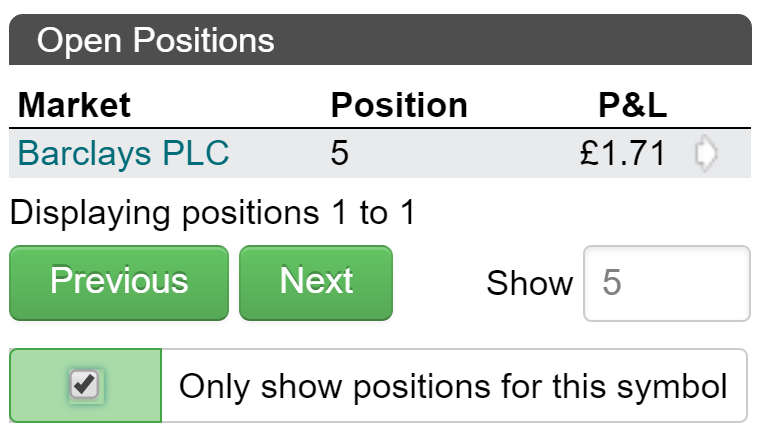 The 'Price Tickers' at the top of the deal tick display the current bid and ask if available. Buy At Ask - An order to buy at the best ask price available on the market. Sell At Bid - An order to sell at the best bid price available on the market. Buy at a Limit - An order to buy if the ask price falls below the price specified. This can be set to the current ask price by clicking on the 'Buy at' price ticker. Sell at a Limit - An order to sell if the bid price rises above the price specified. This can be set to the current bid price by clicking on the 'Sell at' price ticker. Buy at a Stop - An order to buy if the ask price rises above the price specified. This can be used to buy if the price breaks above a Resistance Level. Sell at a Stop - An order to sell if the bid price falls below the price specified. Close position at Bid or Ask - An order to sell at the best bid price available on the market, whereby the quantity will be set based on the existing open position quantity. 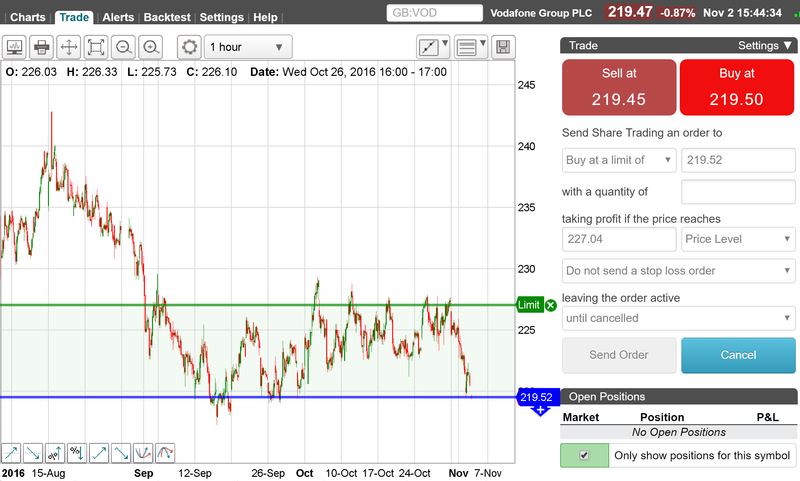 The price associated with orders can be adjusted using the 'Trade Off The Chart' functionality. 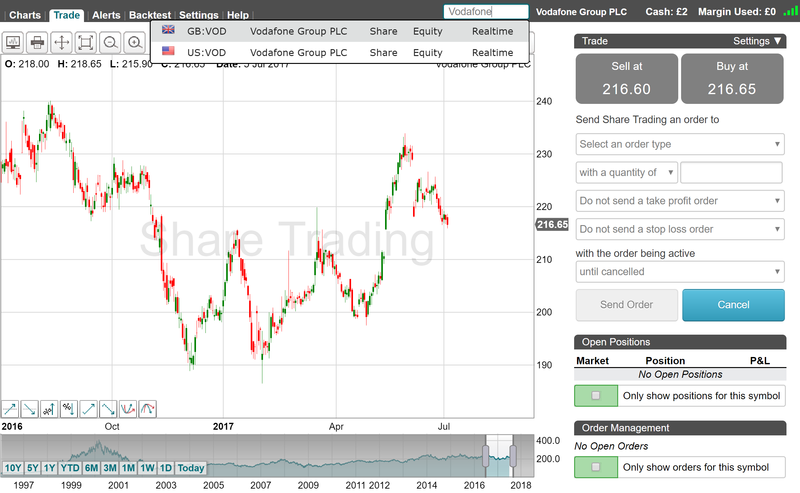 Drag the 'Trade Off The Chart' lines to adjust the order price, by holding down the mouse button when hovering over the order line or label on the chart. 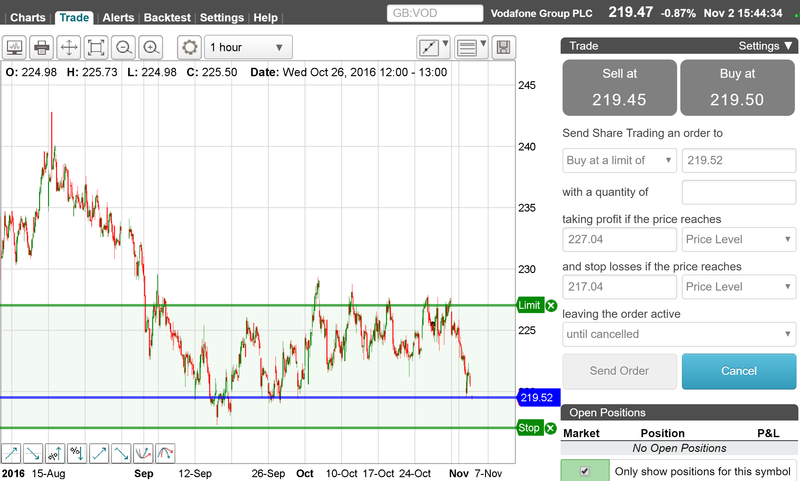 For more information see the Trade Off The Chart feature overview. 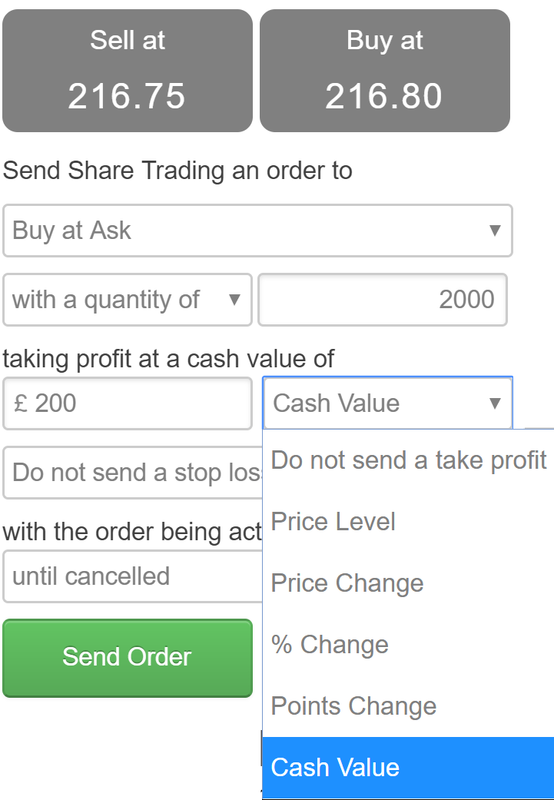 at a trade value of - Enter the cash value that you want to spend when buying shares, or release if selling shares. When buying shares the cash value will be the total cash expenditure including commission and taxes. When selling, the cash value will be the net amount after commissions and taxes. The cash value is in the currency of the trading account. The executed transaction cash value will vary based on the fill price and the nearest number of shares that can be bought or sold. The Take Profit and Stop Loss orders are sent to the market when the opening order is filled or partially filled i.e. Order Sends Order. If there is a partial fill, then the Take Profit and Stop Loss orders will be sent with the partial fill quantity. If the Take Profit order is filled, the Stop Loss order will be cancelled and vice versa if the Stop Loss order is filled i.e. Order Cancels Order. If the Take Profit is partially filled, the Stop Loss order quantity will be reduced accordingly and vice versa if the Stop Loss is partially filled. If you intend to create Take Profit or Stop Loss orders, it is good practice to add them to the opening order, rather than creating individual orders. 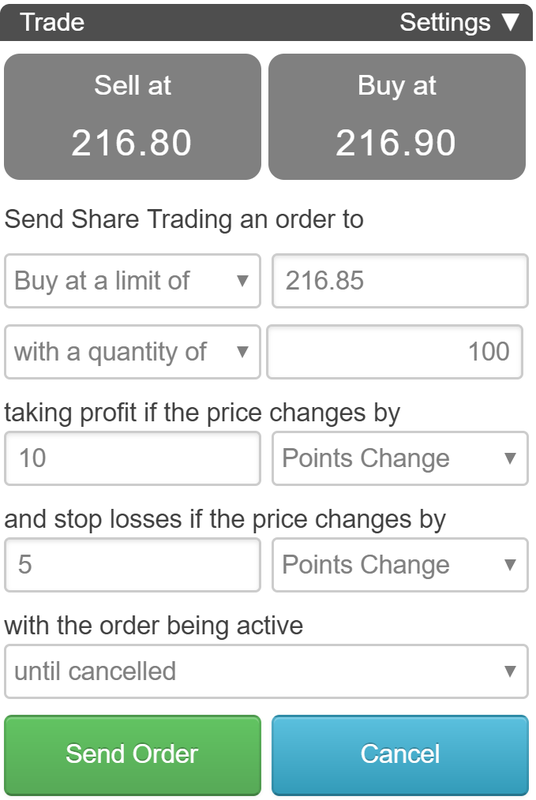 Doing so removes the need to manually cancelled unconnected orders after the open position is closed, for example, if you opened a position, then created an order to "Sell at a Limit" and another unconnected order to "Sell at a Stop", if the Stop filled, you would have to manually cancel the Limit order. In addition, if the Stop partially filled, you would have to adjust the quantity of the Limit order. If you forget to cancel the unconnected orders after the position is closed, it could result in executing a trade that you had not planned. By linking the Take Profit and Stop Loss to the opening order, if the Stop fills, then the Take Profit is cancelled; if the Stop is partially filled, then the Take Profit quantity is reduced accordingly and vice versa. If another trade is executed to close the position, Take Profit or Stop Loss orders that are associated with the matched opening order are cancelled. 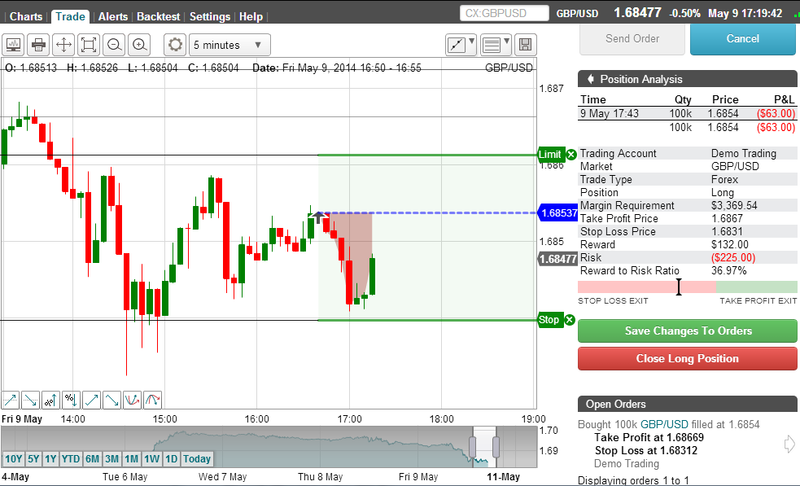 Price Change - Enter the Take Profit or Stop Loss offset in terms of price e.g. 20 for 20 pence or 0.50 for 50 cents. The value entered is added to or subtracted from the fill price of the opening order to create the Take Profit and Stop Loss orders. % Change - Enter the Take Profit or Stop Loss offset in terms of percentage change in the price e.g. 3 for 3%. The value entered is used to calculate the price that is added to or subtracted from the fill price of the opening order, to create the Take Profit and Stop Loss orders. 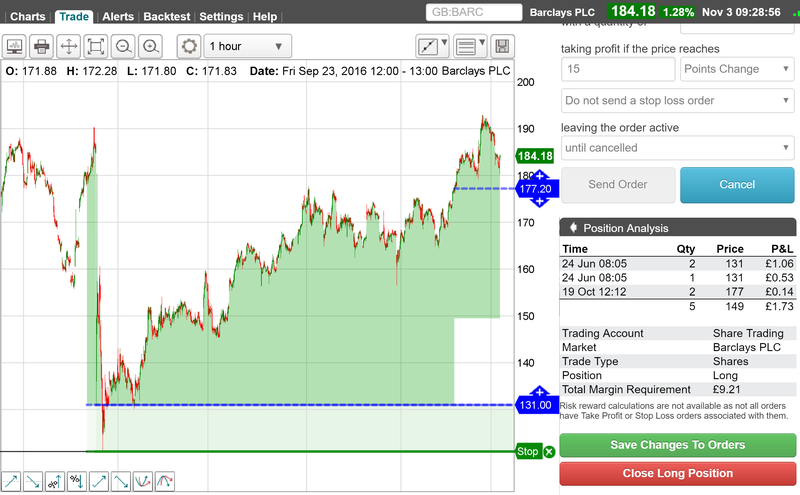 Points Change - Enter the Take Profit or Stop Loss offset in terms of Points e.g. 20 which is 20 pence on Vodafone. The value entered is used to calculate the price that is added to or subtracted from the fill price of the opening order, to create the Take Profit and Stop Loss orders. The point size varies for each market, therefore please check how much one point represents by setting the Take Profit or Stop Loss to 1 Points Change. 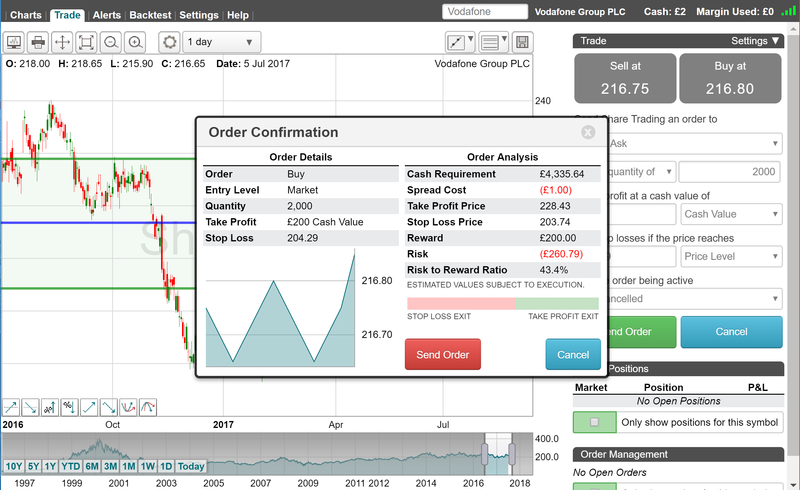 Cash Value - Enter the Take Profit or Stop Loss cash value that you want to realise. The Take Profit cash value will be the net cash after commission and taxes. The Stop Loss cash value will the total loss including commission and taxes. The cash values are in the currency of the trading account. The executed transaction cash value will vary based on the fill price and the nearest number of shares that can be bought or sold. The Price Level order is useful for aligning Take Profit and Stop Loss orders with known points of support and resistance. The Change order types are useful for creating orders with pre-determined win-loss ratios. It should be noted that if the Take Profit and Stop Loss orders are placed too closely, it is possible that during periods of high volatility both orders can be filled before order cancellations are processed by the exchange or liquidity providers. Should this occur a corrective trade will be automatically executed as short positions are not permitted. for today only - The order will remain active for the current trading trade. If the order has not been executed at the end of the trading day, it will be cancelled. Orders are validated before being sent for execution. If you do not have enough funds the order will be rejected. To fully utilise available cash, use 'limit' orders. All orders will remain on the market until they are filled, cancelled or expired. 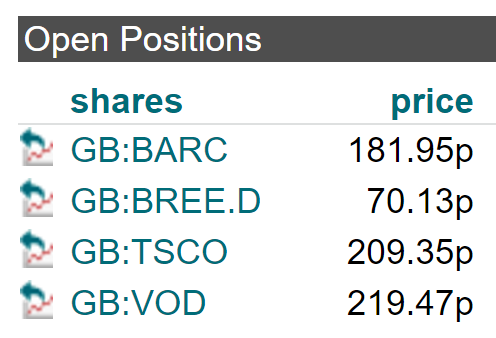 The "Open Positions" section displays current open positions and related Profit & Losses excluding taxes and commissions. To view the net profit and loss after taxes and commissions view the Portfolio Account screen. 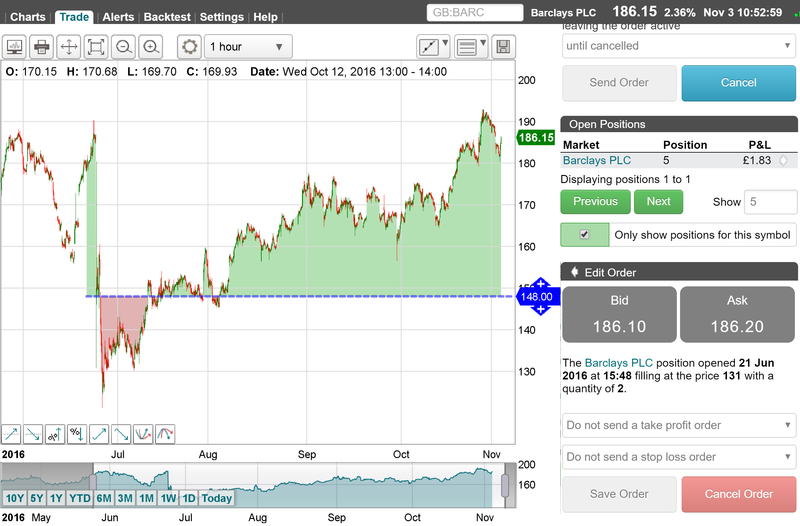 When viewing all open positions, click on the name of the market displayed in the list of open positions to trade the selected market and see related charting information. 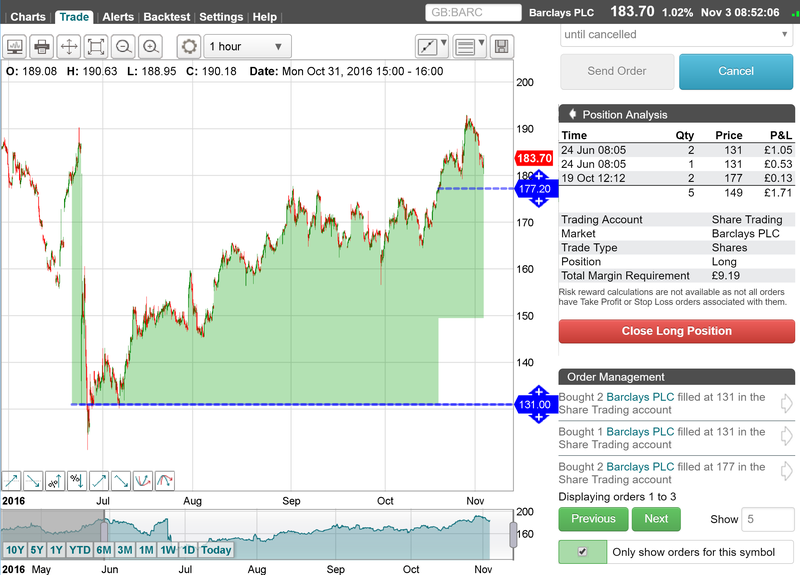 The Open Positions can be filtered to only display the open position for the current market displayed on the chart, by ticking the 'Only show positions for this symbol" check box. 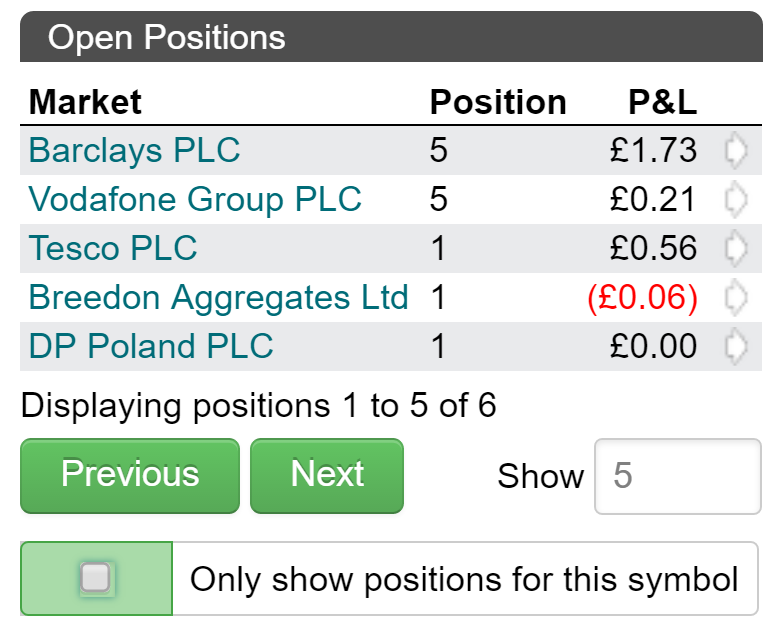 Note that if you have multiple positions contributing to the open position, Take Profit and Stop Loss orders will have to be edited for each position. 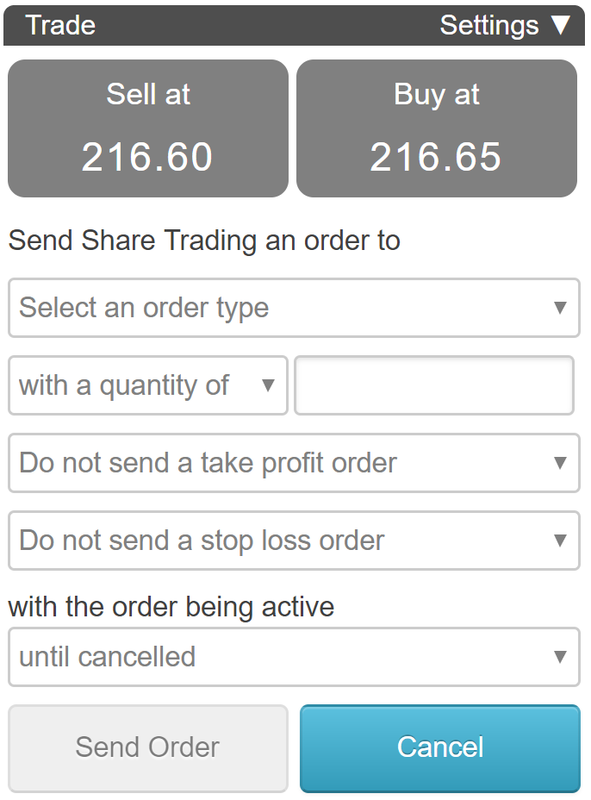 After editing the Take Profit and Stop Loss orders, click on the 'Save Changes To Orders' button. Adding Take Profit and Stop Losses to an existing open position utilises the Order Cancels Order functionality discussed above. In doing so, if one side of the Take Profit or Stop Loss fills, the other will be cancelled, and if a closing order is matched against the opening order with the Take Profit and Stop Loss orders, the related Take Profit and Stop Loss orders will be cancelled. To save changes after editing click on the 'Save Changes To Orders' button, or click on the back arrow on the Edit Order header, as per the position analysis section.